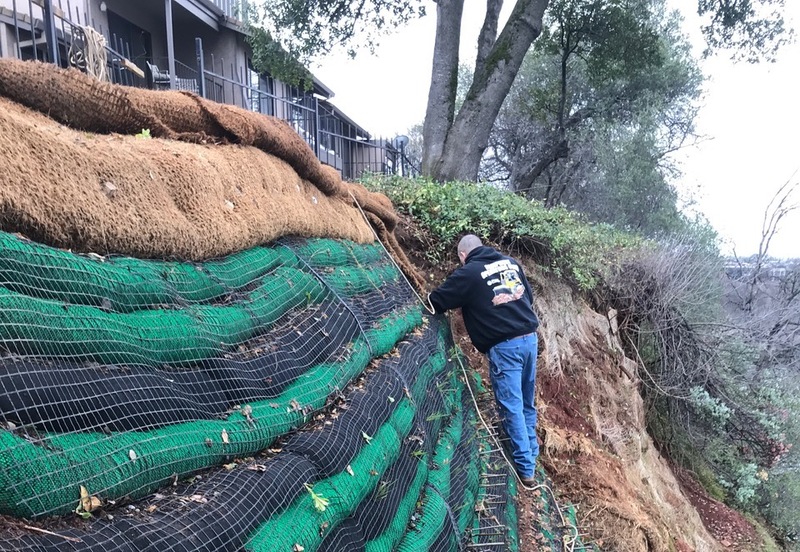 This Biotechnical Soil / Slope Stabilization used to protect top of slope recession on the Bluffs above Redding’s Sacramento River. “The Bluffs” condominiums in Redding CA have provided spectacular views of the Sacramento River, Redding City, and the mountains to the west since they were developed in the 1970’s. The best views are afforded to those “condos” which are set back only 35’ from the cliff (bluff) edge. The bluffs are over 200-ft high above the river. 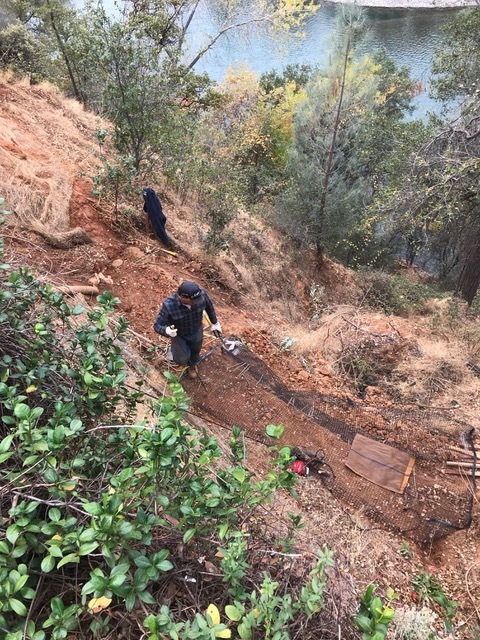 The slope is generally stable, even though the slope averages 0.5V:1H, as it is well vegetated with Canyon Live Oaks, Pines, shrubs, a few willows, and some native grasses. The soil is derived from sedimentary conglomerate deposited tens of thousands of years ago. The bluffs are relatively stable from erosion. It takes very severe runoff to erode. Lateral recession on this site is less than 1-ft to 3-ft since “The Bluffs” were built over 40 years ago. 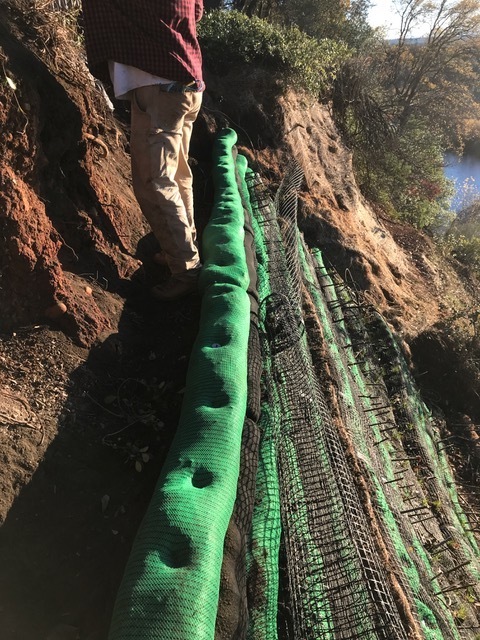 However a few locations along the property have experienced shallow gully or slumping erosion due primarily to irrigation water line breaks. Fig 1 – The bluffs are about 200’ high. 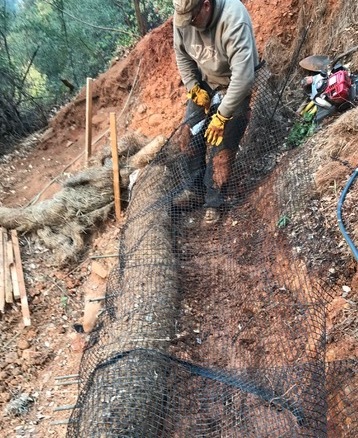 We decided to start the structure at a stable platform approximately 25’ vertical below top of bank. The Condos were built close together which only allowed a concrete path wide enough for wheelbarrow access. Therefore all materials would be carried or wheel-borrowed and carried down by ladder. The slope was probably about 0.5H:1V. A softy rope was required always and sometimes the equipment and tools needed to be tied off. The Sacramento River was about 150’ to catch them if they fell! Fig 3 and 4 The Growsoxx were about 3’ long and the Siltsoxx were 10-12’ long, each could be carried by hand. 1. There was no equipment access between the condos, wheelbarrow only. 2. The desired outcome was to return the slope to restore some of the contours. That would require an average of roughly 3-4ft of fill horizontally. 3. A soldier pile wall or adding compacted layers of engineered fill, 0.5:1 slope over 20-ft high was not feasible. 4. 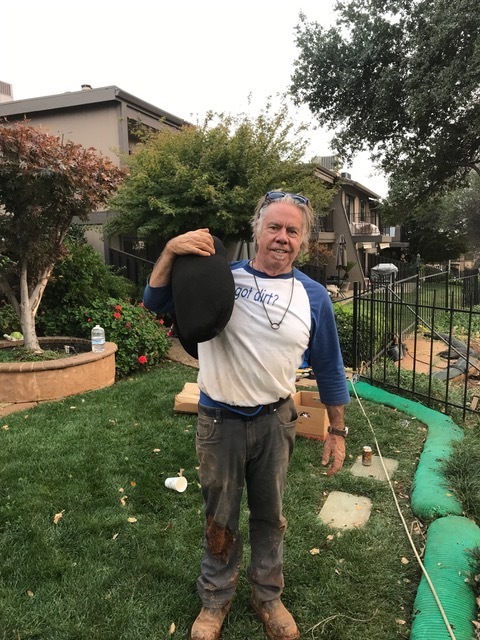 A lighter fill comprised of 50% sandy/gravelly loam mixed with 50% composted OM, reinforced with geogrid and roots seemed possible given the wheelbarrow transport and hand shovel restrictions. 5. 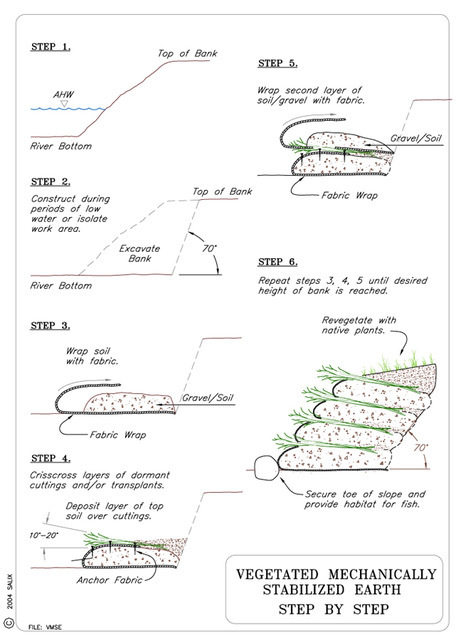 A rule of thumb for bioengineering on steep adverse soils is to compensate for lack of compaction (engineered soils) with lots of reinforcement (geogrids and geotextiles initially and variable roots long term) and use relatively free draining soils with added cohesion (in the form of fungi, humus, and organic matter). 6. Compost-filled socks were selected for both reinforced fill and an excellent growth medium. We relied on compost socks for over half of the needed fill, and was also used as the new slope facing. 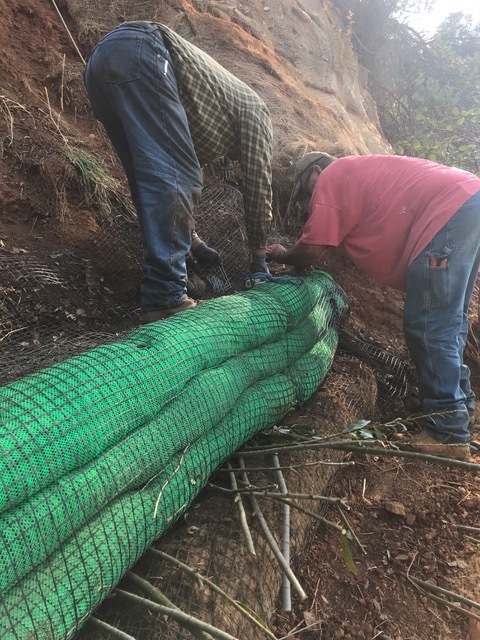 The compost was relatively light so we weren’t putting an inordinate amount of weight on the steep slope and the “encapsulated” compost socks allows us many opportunities to “anchor” the structural elements to each other and to the slope. 7. The Filtrexx Siltsoxx and Growsoxx proved to be perfect product components for this project. Growsoxx are produced to grow vegetation really well. The compost filling them is certified compliant with the US Compost Council and there are many successfully documented projects using the Growsoxx to establish “living walls”. The Siltsoxx, on the other hand, are particularly designed to filter sediment-laden water. 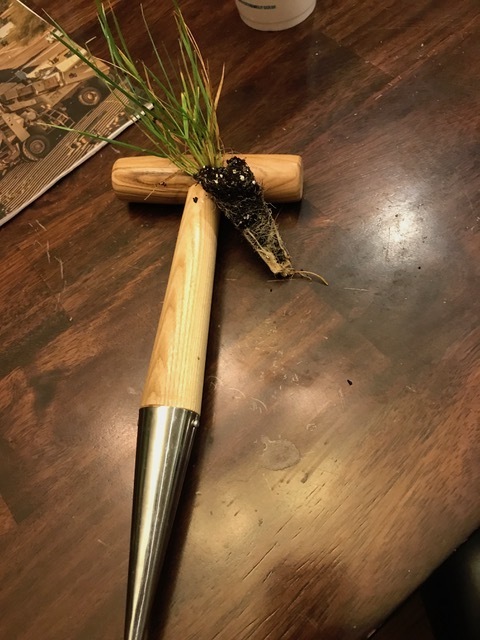 Because they are filled with a larger gradation of composted chips and stems, averaging 5/8” diameter, they allow free drainage but and are thought to be less effective as a growing medium. 8. I used some specific rationale in selecting both Siltsoxx and Growsoxx for this job. 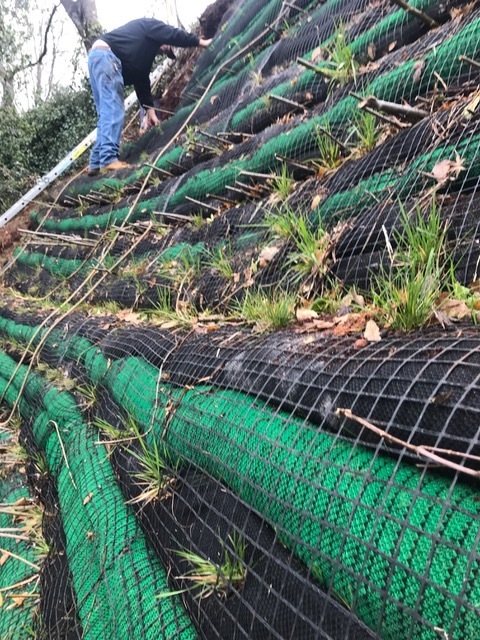 The material enveloping the Siltsoxx (green geotextile) appears stronger and longer lasting. 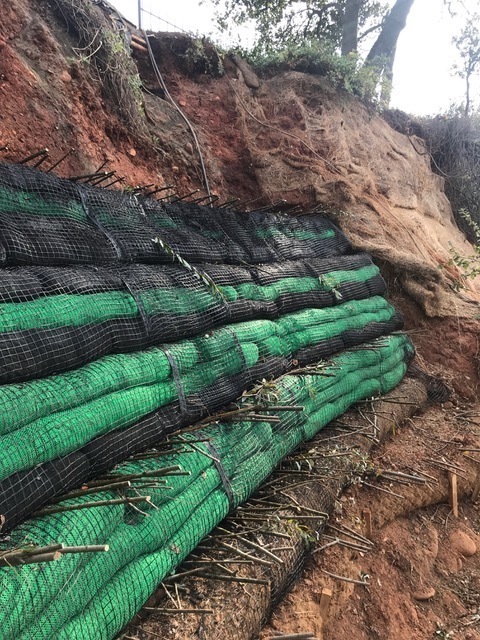 If we use the Siltsoxx along the horizontal areas “lifts” where we plant / install willow branches (brushlayering) then having a super growth medium on the slope surface is not that important. Remember the willows will root from deeper into the slope. And the bigger wood chip gradations will last longer. 9. I further theorized that the Growsoxx would be better used behind the Siltsoxx, deeper in the slope, when brushlayering is used. That is where the willow roots will need good growth medium. 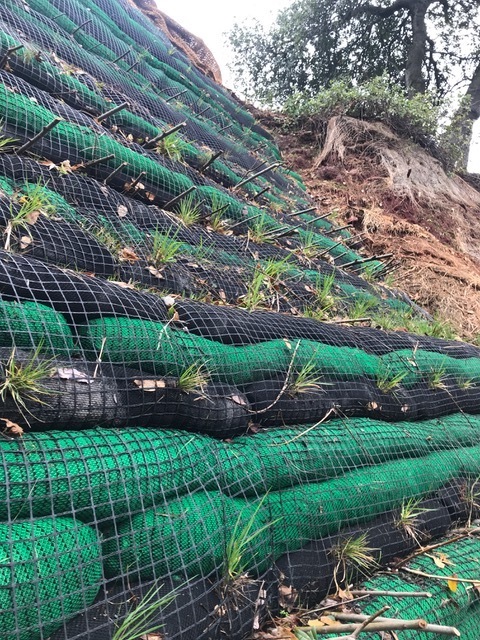 Conversely, the Growsoxx will be more effective on the slope outer face when we are relying on native grasses and grass plugs to take over. Figs 5 & 6 Willow Brushlayering and Geogrid were, in my opinion, the most critical elements on this project, where typical engineering criteria was not feasible or desirable, like engineered and compacted fill (woody and herbaceous growth is minimized as compaction reaches 90% or more) and soil nails (drilling into the face of the bluffs conglomerate was also infeasible). Fig. 7 A similar slump/erosion feature nearby revealed the stability and beneficial “buttressing” provided by a single willow shrub! We planted nearly 200 branches and expect very good establishment. 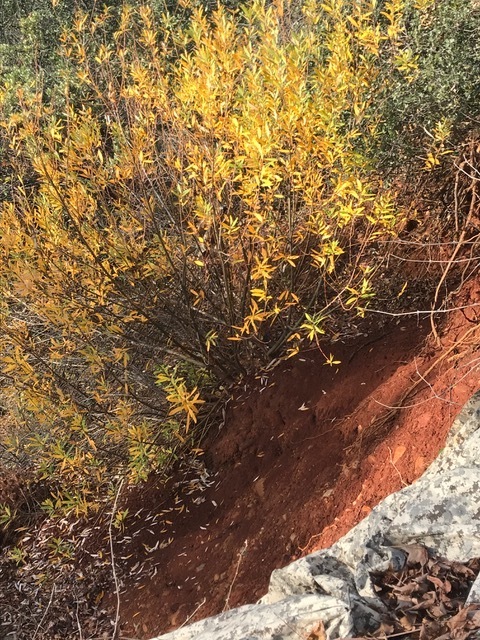 A geomorphic-based investigation of the bluffs revealed that trees, native grasses and willows were abundant and probably responsible for the relative stability from erosion of the Bluffs in general. 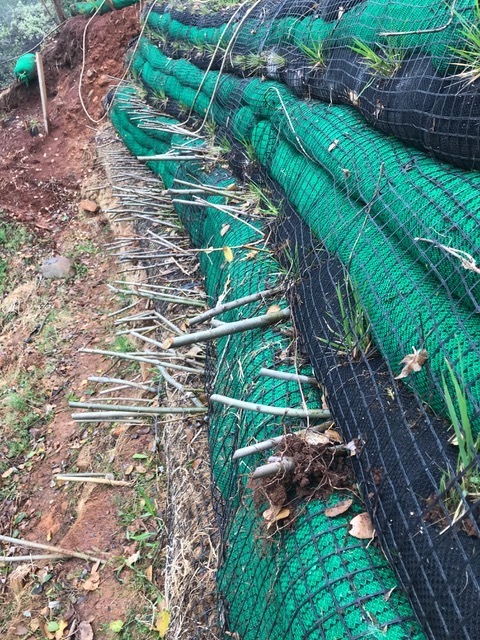 Figs 8 & 9 A dibble tool used to insert grass plug through geogrid and into the compost sock. Fig 10 & 11 The plugs are growing rapidly, size has increased by 200% in just 4 weeks. 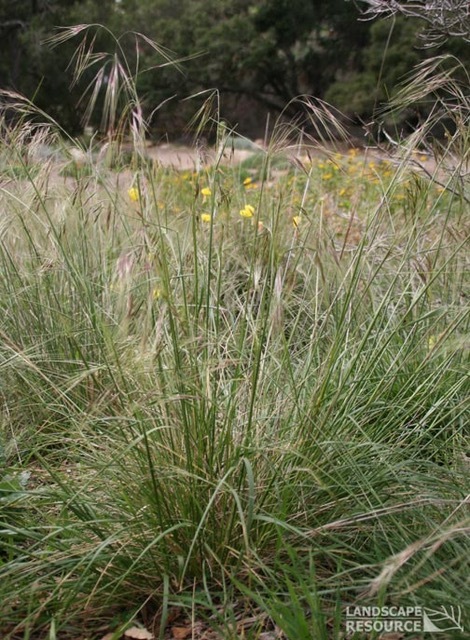 The full-grown Nassella is probably two to three years old. For more information on this and more projects visit Dirttime.tv again. In the near future, we will be offering technical case studies, self-published in, pdf format.